The two pictures above were taken today in natural light. The two from the previous post were taken at night under my Ott-Lite. There's a huge differnce! I was also very fortunate that my dh got me a nice camera for Christmas. It's a Nikon D40. It's big and slightly bulky, but I love it. And I still need to learn a ton about. I also set the ISO to 1600, which really makes the stitching stand out. Don't ask me what ISO means, I just know it's an option. I'll have to look into that a little more. :) Like I said I really don't know much, but I do know natural lighting makes all the difference! I'd love to take a class one day. Well, I'm watching all the kids, so I'd better go! Write later! Thank you for this entry! Now I definitely can't wait until spring when the sun will stay out! Your stitching is really nice and that is what probably makes the picture so good!! My DH know so much about photography, I will ask him about the ISO. Garden Girl is really coming along!! 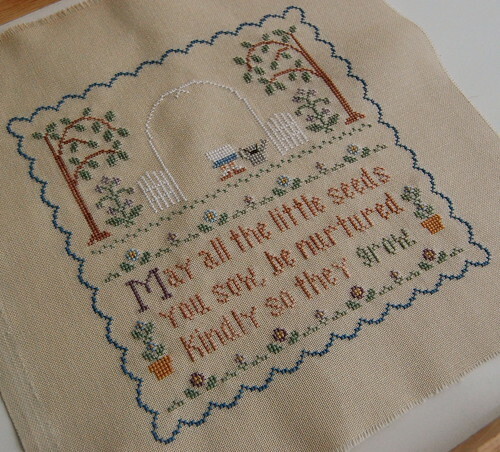 Gorgeous stitching!!! I always LOVE your pictures - they are top quality. Garden Girl is looking great, your photos always look so good. Your photos a just lovely, Nicole. 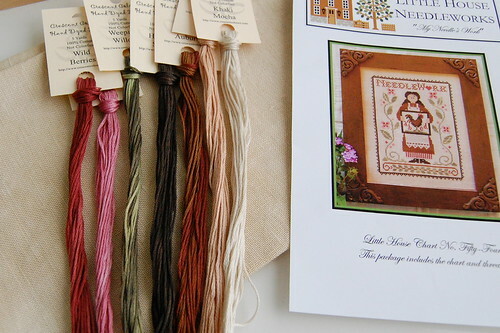 I received my LHN My Needle's Work chart/threads in the mail today. Just waiting on the fabric from another order I've placed elsewhere. Such a cute design. Nicole - you should definitely look at taking a class - I know that Nikon offers 2 free classes with the purchase of one of their SLR cameras (I know because I own one! ).